Hi guys! Today I've got a wonderful polish to show you. I got this one as a gift from Deborah when she came back from her holiday in the US, isn't she sweet? I do love me a good red and it fits the holiday season very well. Let's take a look at Wet n Wild Burgundy Frost! 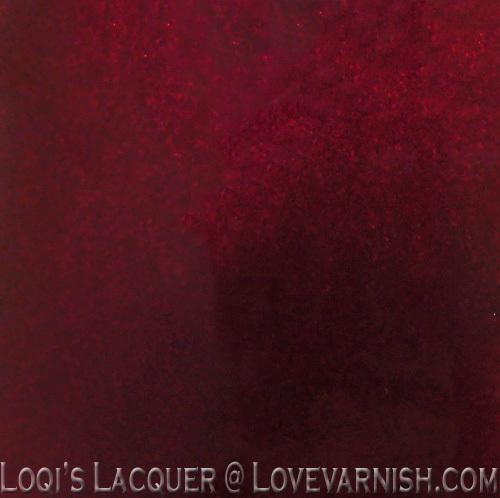 Burgundy frost is a gorgeous vibrant red (burgundy, doh!) colour. It's not a frosty polish though, it's a wonderful glowy shimmer. Shown here is 3 thin coats with topcoat. It's such a gorgeous colour! And for some reason it made my nails look extra long and thin. I don't have a lot more to say about this polish. It's simply gorgeous and I love it! I hope you guys like it too and see you next week! 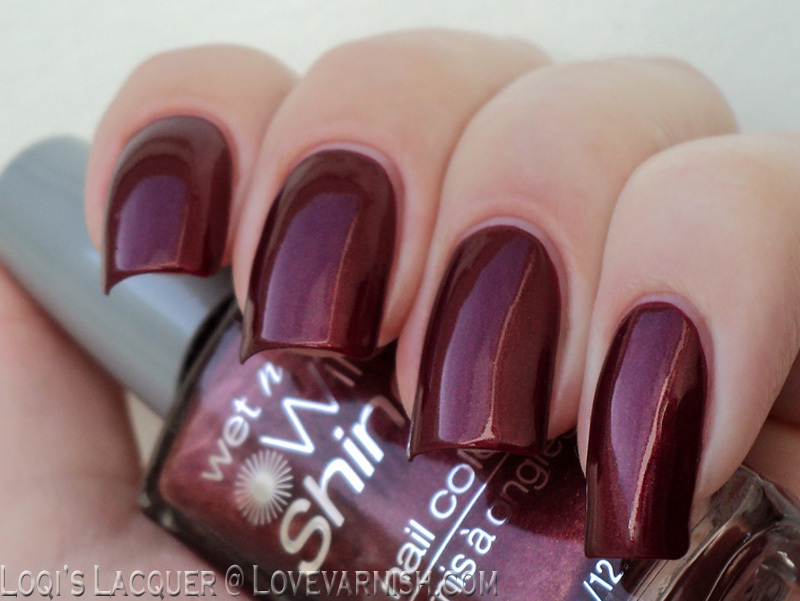 This is such a gorgeous polish for a drugstore brand - heck any brand! It also looks amazing on you! That is gorgeous! Especially for how cheap W&W is, I'm always surprised by how great quality the brand is, love it! My favorite burgundy to date! Water marbles fantasticly too! A classy polish that's perfect for the holidays. Beautiful! So many ways to wear that shade! I just saw a similar shade on another blog from an indie brand at a much higher price point. 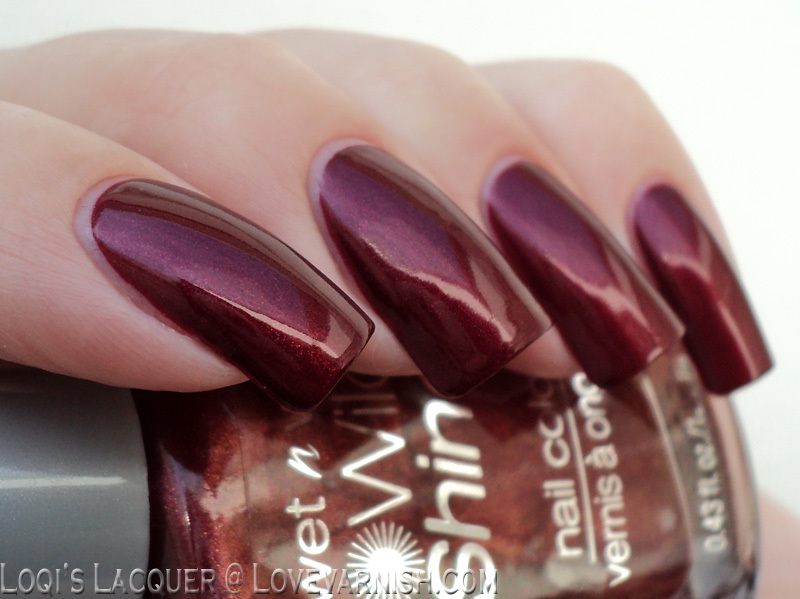 I will look for WnW Burgundy Frost today!! Stunning color for the holidays! I don't know why this hasn't caught my eye in stores yet, its simply stunning. And I noticed it did make your nails look really long. One of my fave shades ever! What a pretty shade of burgundy. Love it! That's a super pretty shade! Wet'n'Wild recently started being sold in Italy but I have yet to stumble upon a display. I can't wait! This color is really pretty. It is such a rich wine color and it is great for winter. OMG! You seriously made this polish look worthy of a Louboutin price tag! AMAZING mani! This is pretty! I seriously love WnW! Whoaaa this is so so pretty! Oh, oh, oh I need this shade! Gorgeous polish, and your swatches are amazing! Surprisingly I don't own any WnW, but this definitely needs to be mine! OMG! Now I need that polish! It's so beautiful!! I am always surprised at how nice some of the WnW polishes are! I love this one! That shade is perfect I've never tried Wet nWild polish, but I'll have to take a second look. wow, i can't believe this is from wet n wild. it looks so nice! Oh my gosh - I just seen this polish in a display - I didn't realize how beautiful it was ;) I am gonna go get it. Love to visit this blog. Amazing !!! I've only tried a few WnW polishes so far, but I love them all! Oooh that's good to know, thanks! It would look awesome with some gold stamping I think! :D Glad I could save you some money! Weird how some colours have that effect right? I can see why! I love it! ooh lucky you! I hope you find them soon! It really is a perfect winter colour, I agree. I've only tried a few of their polishes, but I've loved all of them so far! I'm the same with the Essence and Catrice displays. It's a shame indeed, I sometimes miss really good shades. :D I hope you find something nice! Great swatches! This polish looks gorgeous! WOW... that looks like a stunning shade! This is such a great color! I always ignore this brand but after seeing this, I'm going to make an effort to look out for them more! Looks gorgeous on you! Your cuticle lines are amazingly neat btw! Thanks Hannah! It's so much fun to look back and it works inspiring as well - I did some distressed nails again last week :D.
Yup, it's quite inexpensive and fun! I agree it was a great look! Thanks so much Jenny :).